George Jennings made significant contributions to the Force and was in key positions to assist with the development of the Force and its contributions to Canada. He was born at Toronto Ontario on May 3rd 1875 to the son of Robert Cummings Jennings. George graduated from Woodstock College and attended the Canadian Business College at Hamilton Ontario. Upon graduating, he commenced a banking career. Seeking a more active and adventurous career, he applied for and received a commission as a Lieutenant in the 48th Highlanders in Toronto and later transferred to the 38th Haldimand Rifles. When the Canadian government agreed to send troops to the Boer War in South Africa, George Jennings sought and received a ‘leave of absence‘ to be a Trooper in the 2nd Canadian Mounted Rifles. When the war ended, he returned to Canada in 1902 and received a commission as a Captain in the 90th Regiment in Winnipeg. The attraction of the Royal Northwest Mounted Police (RNWMP) was appealing to George Jennings. So he applied and was accepted into the Force on August 1st, 1906. Upon being sworn in, George received a commission to the rank of Inspector and assigned the officer number of O.147. At the time of his appointment, his annual salary was $1,000. After his orientation training at “Depot” barracks, he was transferred to many locations before the commencement of World War I: Wood Mountain, Peace River District,Herschel Island, Regina and Edmonton. From May 16 to August 15, 1911, he was a member of the RNWMP Contingent sent to attend the Coronation of His Majesty King George V in London England. It was in September of 1911 that George married Miss Jean Gladys Bowen Perry – daughter of RNWMP Commissioner Bowen Perry. Photograph of RWNMP members in England for the correnation of King George V (Source of photo – RCMP Historical Collections Unit – “Depot” Division). After the outbreak of World War I, George Jennings was appointed as the Registrar of Alien Enemies for the Northern portion of the Alberta. Under the Canadian War Measures Act, all German and Austrian immigrants living in Canada had to register their location an movements. On April 6, 1918, the Canadian government announced their approval for the Force to commence the recruiting for a Cavalry Draft which would consist of Force members and recruited individuals from Western Canada. The original intent was to sent them as a component of the Canadian Expeditionary Force to join in the fighting on the western front. 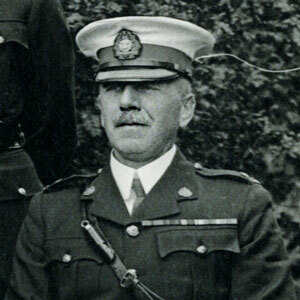 For this Cavalry Draft, Inspector Jennings was appointed to the military rank of Major and would be the Draft’s Officer Commanding. He oversaw the coordination of recruiting and the selection process. Based on the recruiting advertisement in western newspapers, the recruiting drive was closed on May 13, 1918 with 726 applicants: 12 RNWMP Officers; 81 RNWMP NCOs, 150 Constables and 495 new recruits. 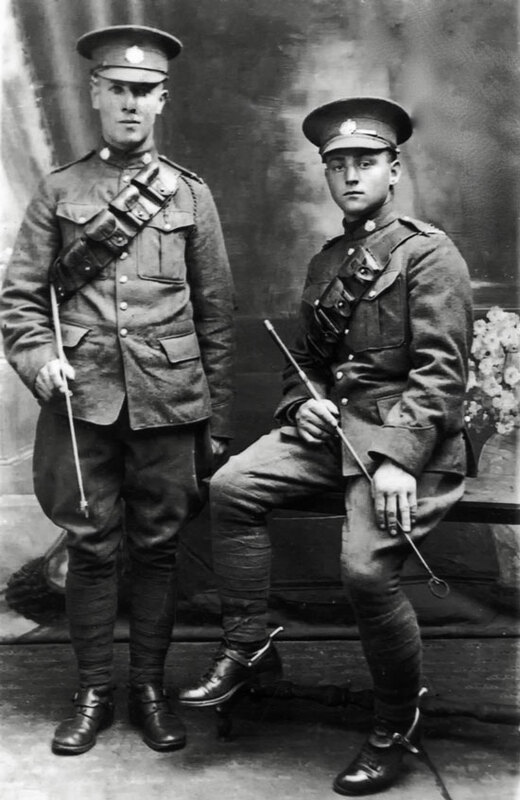 1918 – Photograph of two RNWMP Cavalry Draft members – on the left – Trooper George Chalmers (RNWMP Reg. #7055) and right – Trooper William Richardson (RNWMP Reg. #7054). Photo taken in England. (Source of photo – RCMP Historical Collections Unit – “Depot” Division). The Cavalry Draft was organized into four squadrons and they received preliminary training at the “Depot” barrack. Each Draft member were sworn into the Canadian Expeditionary Forces. On May 30, 1918, the Cavalry Draft departed Regina on two separate CPR trains bound for Montreal then to Halifax and finally to Shorncliffe England. At the Canadian Forces’ base at Shorncliffe, the majority of the Cavalry Draft were dispersed into three deployment groups: Royal Canadian Dragoons; 1st Canadian Tank Battalion and Canadian Light Horse. The majority of the Force members went to the Canadian Light Horse and were deployed to France, Flanders and as part of the occupation force in Germany after the signing of the armistice. 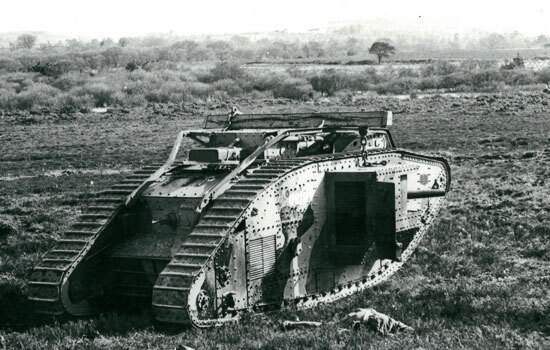 British Mark IV tank which the 1st Canadian Tank Battalion used to train on (Source of photo – RCMP Historical Collections Unit – “Depot” Division). The Squadron remained in Europe after the armistice which came into effect on November 1918. With labour unrest and strikes occurring in western Canada, the Canadian government was anxious for the ex-RNWMP members to return to Canada. Steps were undertaken to expedite their swift return of all ex-RNWMP members serving overseas. Major Jennings was tasked to coordinate the gathering together of ex-RNWMP members who were in occupied Germany, Belgium and in England. The delay in the arrive of the ex-RNWMP members resulted in three separate contingents returning to Canada then catching a train to Regina. Upon arriving in Regina, the ex-RNWMP members would be demobilized from the Canadian Expeditionary Force and be re-engaged back into the Force. Major Jennings was returning with the last contingent which consisted of over 100 troopers. With the outbreak of the Winnipeg General Strike in May 1919, Major Jennings received orders to detrain at Winnipeg and were demobilized then re-engaged in the Force. 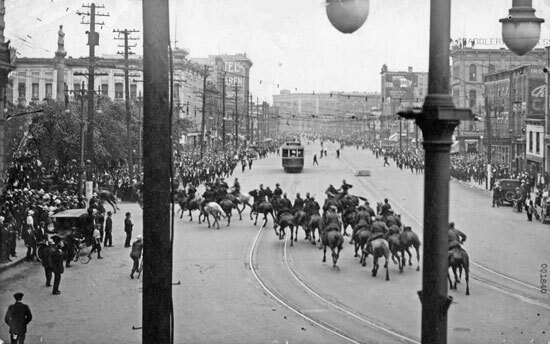 Winnipeg General Strike: June 21, 1919 – Two troops of RCMP members regrouped and returend north. Believing that the three dismounted men would be killed, the order was given to draw revolvers. Turning left down William Street towards City Hall. A warning volley was fired over the heads of the gathering. When this failed to have effect, a second volley was fired low into the crowd which then began to disperse. (Source of photo – RCMP Historical Collections Unit – “Depot” Division). With the confrontations escalating in Winnipeg, it was Inspector Jennings who was in command of the mounted troops and received his direction from Superintendent Starnes (Officer Commanding in the District). Force members remained in Winnipeg and were deployed until the situation was under total control. 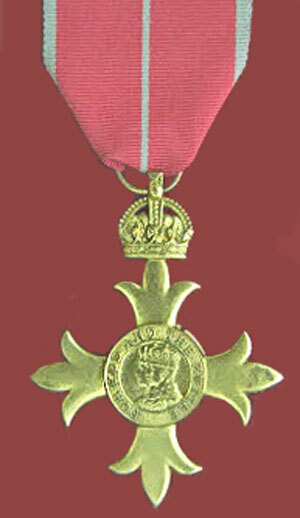 For his service overseas, George Jennings was made an Officer of the Order of the British Empire (Auth. LG No.31370, June 3, 1919). In addition, he was mentioned in despatches by Sir Douglas Haig (Auth. LG No. 1448, dated 11 June 1919). On February 1, 1920, George Jennings was promoted to the rank of Superintendent and was placed in command of “G” Division. Several years later, he was transferred to Prince Albert. In May 1928, he was transferred to “O” Division in Toronto and remained there until February 1932. 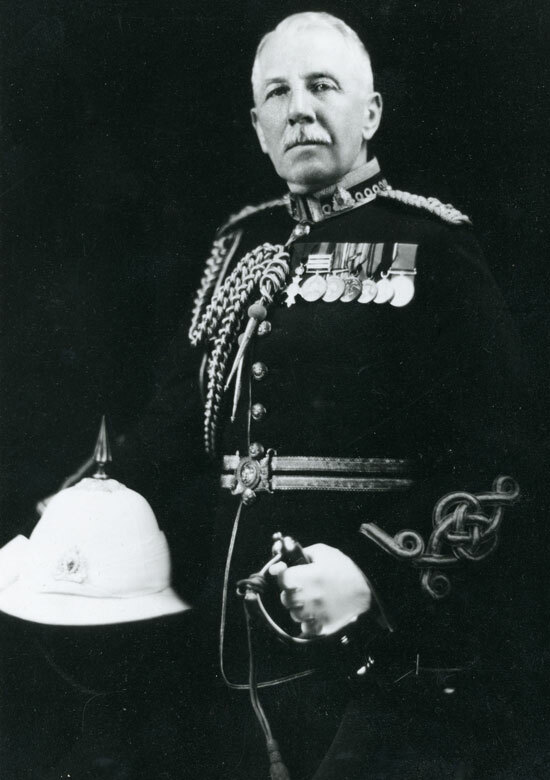 With the Force taking over the provincial policing duties in many provinces (Alberta, Manitoba, New Brunswick, Prince Edward Island and Nova Scotia) in 1932, George Jennings was transferred to Headquarters Ottawa as the new Director of Criminal Investigations. With this transfer, he was promoted to Assistant Commissioner on March 1, 1932. On April 23, 1937, he was promoted again to the rank of Deputy Commissioner and being the second in command of the Force. George Jennings retired from the Force on August 1, 1938 to Ottawa. Thereafter, they moved to Vancouver, B.C. in 1956. His pension was $4,032 per year. On December 26, 1958, George Jennings passed away in Vancouver, B.C. and his body was laid to rest at the Capliano View Cemetery in North Vancouver, B.C. Photograph of Deputy Commissioner George Jennings (Source of photo – RCMP Historical Collections Unit – “Depot” Division).